← Verify and complete your Geocities Download — via HTTP! 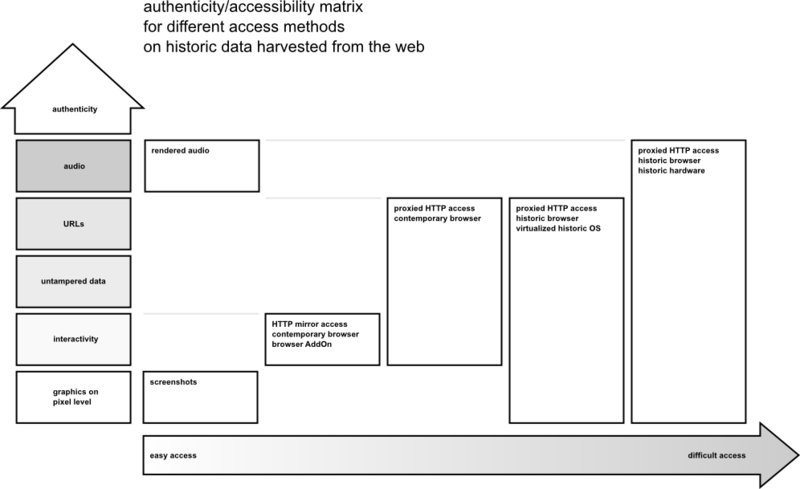 Access to the remains of Geocities can be measured on two axis: authenticity (how realistic can the harvested data be presented again) and ease of access (what technical requirements and what knowledge are needed to gain access on a certain level of authenticity). Graphical authenticity on the pixel level means that a Geocities web page will render exactly as it would to visitors in the time the page was published. This might be considered as esoteric on the grounds that web authors could never be sure how their creations would appear to their audience, by the nature of HTML itself. However, web authors often were not aware of this fact and people of the 1990’s used different browsers on different operating systems than we do today. The dominance of for example Netscape browsers and a certain set of plugins meant that most people would experience a web page in a certain way that was very different from accessing it now with Webkit based browsers. What has changed most significantly in operating systems since the high times of Geocities is the display of text. All current operating systems render characters with smoothed out edges, and this is reflected as much in current web design as the historic aliased pixel text display influenced the web design of the past. Low barrier access to original visual web culture can be provided by screenshots taken from virtual machines running an historic operating system and browser. If the data should not be tampered with, neither on the client nor on the mirror server, and URLs shown in the browser’s address bar should be the exact originals, a proxy server must be put in front of the mirror server. This proxy can transparently re-direct requests to for example http://www.geocities.com/ to http://mirror.local/www.geocities.com/ without the need for any name server tricks or changing historic HTML code. It is trivial to write such a proxy in nodejs for example. As even the oldest browsers support proxy servers, one can employ this system on a virtualized historic operating system like Windows 95 or Windows 98 with authentic web browsers. This significantly raises the access barrier though, as access to such a proxy must be technically restricted, or the Internet will collapse.3 Also, virtual machine software, historic operating systems and historic browsers and plugins are not easily available to the largest part of web users that might be interested in looking at their cultural past. The largest authenticity surface is covered by using all the before mentioned techniques and running historic hardware. Current virtualization and emulation systems are quite good in re-creating all aspects of 1990’s computers, except audio. There are just not enough business critical MIDI files out there to make companies like VMWare emulate OPL3 sound chips. Additionally, all graphical output looks very different on CRT monitors and their special surface-to-pixel ratios than it does on contemporary flat screens. For example, when looking at historic web pages on a 800×600 pixel 14″ CRT screen with a 60Hz refresh rate, it becomes clear why many people decided to use dark backgrounds and bright text for their designs instead of emulating paper with black text on a white background. While restoration work must be done on the right end of the scale to provide a very authentic re-creation of the web’s past, it is just as important to work on every point of the scale in between to allow the broadest possible audience to experience the most authentic re-enactment of Geocities that is comfortable for consumption on many levels of expertise and interest.